Where did Hernan Cortes grow up? Hernan Cortes was born in Medellín, Spain in 1485. He came from a fairly famous family and his father was a captain in the Spanish army. His parents wanted him to become a lawyer and sent him to school to study law when he was fourteen. Cortes wasn't interested in becoming a lawyer and returned home when he was sixteen. 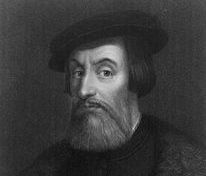 Cortes heard of Christopher Columbus' discoveries in the new world. He wanted to travel and see new lands. He also wanted to make his fortune and fame. Cortes sailed for the New World in 1504. He first arrived on the island of Hispaniola at the city of Santo Domingo. He got a job as a notary and over the next five years made a name for himself on the island. In 1511, Cortes joined Diego Velazquez on an expedition to Cuba. When Velazquez conquered Cuba, he became governor. Velazquez liked Cortes and helped Cortes to rise in the government. Soon Cortes became a powerful and wealthy figure on the island of Cuba. In 1518, Cortes was put in charge of an expedition to the mainland of Mexico. This was something that he had wanted to do for many years. At the last minute, Governor Velazquez became worried that Cortes would become too powerful and he ordered Cortes not to sail. Cortes disobeyed the order and set sail anyway. Cortes and his men landed at the Yucatan Peninsula in Mexico in April of 1519. He had 11 ships, around 500 men, some horses, and some cannon. He soon met a native woman named Dona Marina. Dona Marina spoke the Nahuatl language of the Aztecs and could help to interpret for Cortes. Cortes heard of the gold and treasures of the Aztecs. He wanted to conquer them and take their treasure for Spain. He requested a meeting with the Aztec Emperor, Montezuma II, but was repeatedly turned down. He then decided to march to the Aztec capital, Tenochtitlan. Gathering his small force of 500 men, Cortes began to march to Tenochtitlan, the heart of the Aztec Empire. Along the way he met with other cities and peoples. He found out that a number of other tribes didn't like their Aztec rulers. He made alliances with them, including the powerful Tlaxcala people. Cortes next arrived at the city of Cholula. It was the second largest city of Mexico and a religious center of the Aztec Empire. When Cortes found out that the people at Cholula planned to kill him in his sleep, he killed around 3,000 nobles, priests, and warriors. He also burned down a portion of the city. When Cortes arrived at Tenochtitlan on November 8, 1519 he was welcomed by the Aztec Emperor Montezuma II. Although Montezuma did not trust Cortes, he thought that Cortes might be the god Quetzalcoatl in human form. Montezuma gave Cortes and his men gifts of gold. He thought that these gifts would keep Cortes from taking over the city, but they just made Cortes want more. Cortes took Montezuma captive within his own city. However, Governor Velasquez from Cuba sent another expedition under conquistador Panfilo de Narvaez to take command from Cortes. Cortes left Tenochtitlan to fight Narvaez. After taking care of Narvaez, Cortes returned to Tenochtitlan. He found out that his men had killed King Montezuma. He decided to flee the city. On the night of June 30, 1520 Cortes and his men escaped from the city. Many of them died. The night is called La Noche Triste, or "The Sad Night". Cortes soon returned to Tenochtitlan with a large army of his allies, the Tlaxcala. He laid siege to the city and eventually conquered the city and with it the Aztec Empire. After conquering the Aztecs, Cortes renamed the city of Tenochtitlan to Mexico City. The city became the Spanish capital of the territory which was called New Spain. Cortes was named governor of the land by King Charles I of Spain. Later in life Cortes fell out of favor with the King of Spain. He was forced to return to Spain to defend himself. In 1541, he participated in an unsuccessful expedition to Algiers where he nearly drowned when his ship was sunk. He died on December 2, 1547 in Spain. Although most people call him Hernan today, he went by Hernando or Fernando during his lifetime. He was the second cousin once removed to conquistador Francisco Pizarro who conquered the Inca Empire in Peru. Cortes married the sister-in-law of governor Velasquez while living in Cuba. He also had a child with his interpreter Dona Marina. While in Mexico he went on an expedition to the north and discovered Baja California. The Gulf of California was originally named the Sea of Cortes.